Gosh I LOVE my kids! Seriously could they be any cuter? I think not! 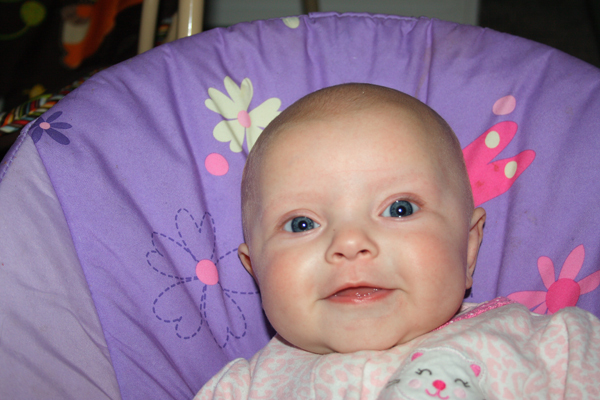 Mallory loves her bouncy seat, she totally is not down with the whole sharing it thing. Mallory had a HUGE milestone last night, she only got up 1 time to eat! I knew, knew knew that blood transfusion would do her some good (I mean seriously look at those pink rosey cheeks, I wouldn't blame you if you were tempted to kiss the screen right now) but really 1 time? REALLY? I know that it's going to still be rocky through chemo but hey, I'll take it! One night is a step up from NO nights! On average I get up at least 3 times a night but usually more like 5-6 times. Although my girly never had much hair, I decided to share some of mine. Not so sure brunette is her color though. 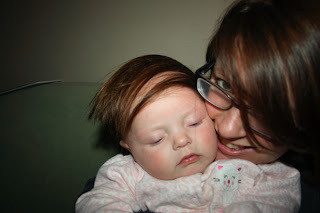 I remember watching a skit on Saturday Night Live about baby wigs, I totally think we may need to get her one (ok so more for the giggles than it being in anyways shape or form practical). She rocks being a bald baby, I love her soft smooth round noggin, I can't stop kissing it all the time. I thought it was going to be tougher because my dear little Jillian had a LOT of hair when she was born but nahhhhh both of my girls are SO different, personality and with looks. This is baby Jillian (same age as Mallory), so sweet, so kissable. 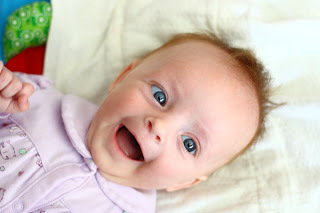 Mallory is way CHUBBIER, she has a sweet smile and she only shares her big smile once in a great while. Mallory's nose is smaller and so are her eyes. Jillian is whimsical, goes with the flow, and is a total ham. Mallory is strong, knows what she wants and won't give up till you figure it out, and is outgoing and loves everyone. 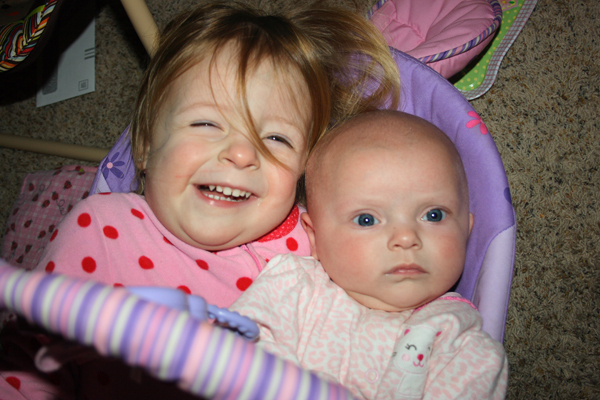 I believe that my kids came in the right order, Jillian has the personality to get her through anything, and Mallory has the personality to fight (I am also assuming now this will equal her being a tough kiddo but that's totally fine, we can manage!). They are adorable girls- That Mallory is a chubby, round, pink healthy looking little thing! You really could kiss her face off!